The late Prof Bongani Mayosi has been remembered in Durban as an exceptional person, a hero and colossal figure who became a medical student at the age of 16, and went on to be a respected scientist who could have made millions and lived anywhere in the world - but remained loyal to his country and its people. And even when perched in the high echelons of academia, he still sided with poor students during the #FeesMustFall movement. The world-renowned cardiologist – who led a team of researchers at the University of Cape Town who discovered the gene that causes heart attacks - took his life on Friday, 27 July 2018, aged 51. 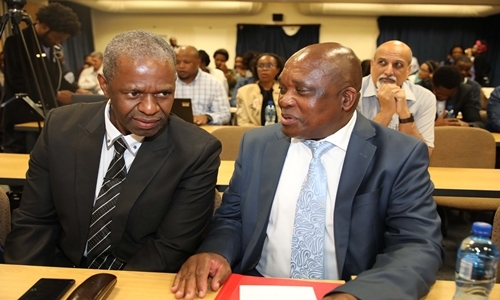 He was the Dean of Health Sciences at the UCT and an A-rated cardiologist, and was awarded the Order of Mapungubwe, the country’s highest honour, in 2009. Yesterday, at an emotion-filled memorial service held at his alma mater, the University of KwaZulu-Natal, former colleagues, classmates, friends – such as Deputy Health Minister Dr Joe Phaahla, KZN Health MEC Dr Sibongiseni Dhlomo and Amajuba District Mayor Dr Musa Ngubane – described Prof Mayosi as a highly driven and selfless individual whose passion for scientific innovation was only matched by his commitment to transformation in academia, and Black academic. 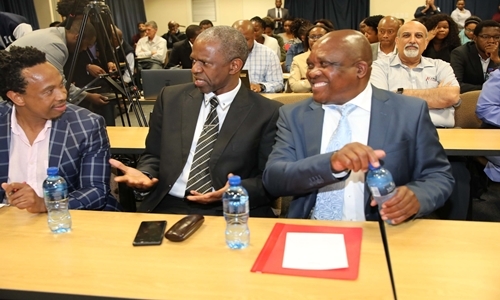 MEC Dhlomo expressed his sadness that Prof Mayosi had demised before the establishment of a new think tank, the African Institute of Health Leaders, which he had committed to being part of. The MEC remembered Mayosi as a committed young scholar and political activist who worked closely freedom fighters such as the late Andrew Zondo, who was executed by the state in 1986. It was hardly surprising, the MEC said, when Mayosi went on to become a an internationally respected academic. “He was part of us when we held night vigils when we protested against the hanging of ANC leaders who were fighting for our freedom. He was part of us when we hired a bus when we went to Cape Town to launch the UDF. As much as he was a political activist, he made his mark as an astute academic in the medical field, both as an undergraduate and post-graduate. He continued being a mentor, researcher and role model recognized locally and internationally. “I was priviledged to receive a letter from Bongani early in June, agreeing to serve in a programme we’re initiating, called African Institute of Health Leaders. Prof Mayosi, a clinical and researcher par excellence was equally aware that we need this cadre to innovate in health systems,” he said. Classmate Dr Mergen Naidoo, from the class of 89, was one of those who carried a 22 year-old Prof Mayosi aloft after he had scored five merit awards in his final year at the then University of KwaZulu-Natal. “He was extremely popular in class. Students who struggled would go to him and he would always help them. Even at a young age, we always knew Bongani was destined for greatness. It was sad to earn that he had passed on the day of the eclipse of the moon. “His research interests were pursued in areas that affected the poor of this country. His death is a great loss not only his family, friend and colleagues, but to the whole country. He was a friend, a mentor and research collaborator. He had gravitas and a scholarly spirit. His kindness shone through his very being.” This solemn gathering also saw the spotlight fall on the scourge of mental illness, particularly depression which, it was argued, must be acknowledged as a disease. “It is fitting that at Bongani’s memorial service we talk about mental health, a scourge that affects us all, young and old, men and women. Don’t matter the colour of your skin. About 20% will have this illness. It’s time we spoke about it. It’s time we spoke about what we can do about it,” said Prof Bonga Chiliza, UKZN’s Head of the Department of Psychiatry. 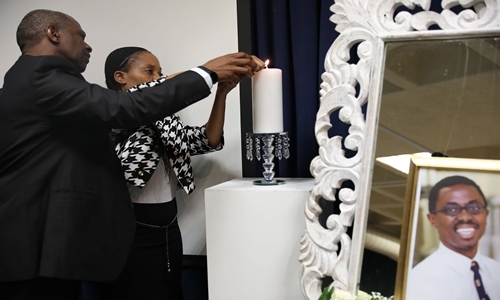 MEC Dhlomo and Lumka Mbuli light a candle in remembrance of Prof Bongani Mayosi. 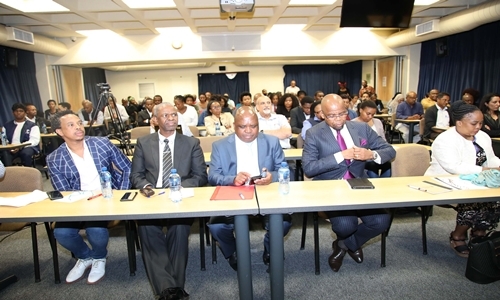 MEC Dhlomo, with Dr Brian Vezi, Dr Joe Phaahla, Dr Musa Ngubane and Prof Busi Ncama. Prof Mayosi’s cousin, Lumka Mbuli, said life has been difficult for the family, but thanked everyone who has supported the family in the wake of his death. She urged all to continue praying for the family. Prof Mayoni will be laid to rest in a special provincial official funeral in Cape Town on Saturday.